In addition to a speech in Miami, the former Florida governor released a Snapchat story about his campaign Monday. White House hopeful Jeb Bush officially announced his bid for presidency at Miami Dade College on Monday afternoon after months of speculation. Alluding to the Super PAC he launched toward the end of 2014, the former Florida governor said early in his speech that he wants to ensure "everyone has the right to rise." Bush didn’t waste any time going after the Democratic Party, and while he didn’t initially spout names, little was left to the imagination. He said the Democrats are gearing up for nothing more than a "no-suspense primary, to hold on to power, to slog on with the same agenda under another name." "That’s all they’ve got," he said, prompting the crowd to chant "Let’s go, Jeb" while he promised to mend the nation through immigration and education reform and make the US an "economic superpower." While the enthusiastic crowd at "the nation’s largest and most diverse university," according to the Miami Herald, cheered and chanted "USA" in support of Bush’s announcement, others took to Twitter to offer their takes on the speech. 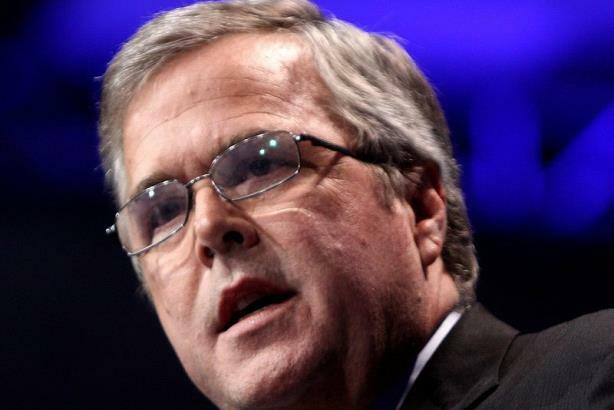 Jeb Bush not shying away from last name, immigration or education reform. Gotta credit that. This is a confident, focused, well delivered speech from @JebBush, whether or not you like him or agree w/ anything he's saying. In an effort to keep his Millennial engagement up to par, a Campaign 2016 Snapchat story was available on the app Monday afternoon, the first few seconds featuring the candidate himself. It offered a closer look at the announcement from Snapchatters on the ground, complete with filters tailored to the event. Tim Miller, Bush’s communications director, talked to Yahoo News about the effort and said "everyone was excited about the opportunity to reach a broad, younger audience." The comms leader said Bush is "a nerd tech of sorts, so he is always wanting to use the freshest tools." In case you missed it, Bush also released his campaign logo over the weekend: Jeb!